Supplied Complete: The Ground Auger Allows Direct Measurements or for Greatest Accuracy Use the Beaker & Soil Preparation Solutions. The PHH200 model has been discontinued. Please see the PHH222 Series as a possible alternative or contact our Flow Engineering department. The PHH-200 kit has been designed to address the question of correct and rapid measurement of pH directly in soil. Every item in this kit has been made to facilitate measurements in the field without compromising accuracy. The PHH-200 can test the pH of soil directly or after preparation of a diluted sample. In order to measure the pH directly; the kit includes a plastic auger to perforate the ground. The pH and temperature can be directly tested with the 4-in-1 conic shaped electrode in even a slightly moist soil. 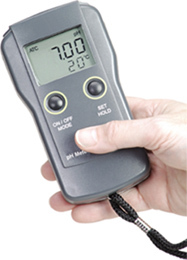 For higher degrees of accuracy, or for stony ground where the electrode may be damaged, use the PHTS-200 test solution. This solution is included in the package to help you measure the pH more precisely by diluting a sample of the soil in it. The PHH-200 is waterproof and sophisticated yet engineered for simplicity. The 4-in-1 pH electrode, PHE-200, has been designed for direct soil measurement. It has a conic, rugged tip and can be directly inserted in moist or soft soil. The electrode incorporates a temperature sensor right near the tip to enable it to measure and compensate for the temperature quickly. It also houses a miniaturized amplifier to boost the signal and provide greater stability in spot measurements. The dual-level LCD shows the pH value from 0 to 14 in hundredths of units. It also displays the temperature on the secondary level at the same time. With a menu-driven custom microprocessor, the user is helped with clear prompts during operation and calibration. The batteries provide up to 1000 hours of continuous operation and indicate the battery level at any time. Calibration is completely automatic and the meter recognizes the buffers too. Any value set by the user as well as the calibration data is retained even during battery replacement. The PHH-200 is ergonomic and has been made for singlehanded use. Together with the meter you will also receive a handy booklet which explains how pH should be measured as well as general information about the correct limits in greenhouses, nurseries, fertilizer solutions as well as fruit and vegetable. PHH-200 is supplied complete with portable waterproof pH meter, pH electrode, ground auger, beaker, soil preparation solution, batteries, and rugged carrying case. 참고: Comes complete with portable waterproof pH meter, pH electrode, ground auger, beaker, soil preparation solution, batteries, and rugged carrying case.